As reports continue to come in, we are learning more of what God did during our recent outreach and training project in the Philippines. How privileged our ministry is to have partners like you who believe in what we are doing, people who send us out to duplicate what Jesus and His disciples did…take the Gospel to the world! A pastor (pictured to the left) who attended one of our Leadership Development Conferences in the Philippines heard me give tips on how to use simple illustrations when sharing the Gospel. Two weeks after the conference as this pastor was overseeing a funeral, he shared the Gospel using a pen illustration he learned…that a pen offered to us as a gift is no good to us unless we reach out and “receive” the pen into our hand, just as Jesus Christ is no good to us unless we “receive” Him into our hearts. At the funeral that day, the pastor led six people to Christ using a pen! 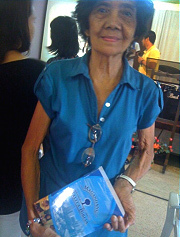 In the photo below from one of our training conferences, this older woman was so happy after she was given a Bible in her local Philippine language, Tagalog. 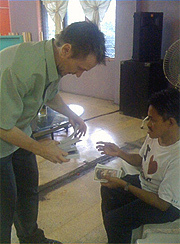 Because of your support, we were able to distribute Bibles to many people who did not have one! Both this month and next, some of our partners in New Mexico and Texas are hosting “BENEFIT DINNERS” for our ministry and you are welcome to join us in Albuquerque, NM (Feb 24), Las Cruces, NM (Feb 25), and Houston, TX (Mar 30)! Contact us for more information: 713-277-8638; info@scottnute.org. In addition, Feb 29-Mar 1 we are conducting an area-wide outreach event on the Mescalero Apache Indian Reservation in NM, including an assembly program in the local schools. Join us in praying for many to come to Christ! Our website has FREE personal evangelism and discipleship materials that you can download. If you are looking for creative and effective ways to share your faith, and for Bible study materials for yourself or those you know, we are happy to make these available to you on our website. People are taking advantage of online giving through our website and have become financial partners via automatic giving, whether it is monthly, quarterly, or one-time gifts. We praise the Lord for how He continues to provide through you, His people! Together, we are making a difference in lives around the world as we continue reaching and training people with the Gospel of Jesus Christ!